I'm an infographic junkie. I thought I'd end the week by sharing 2 great infographics recently released with great stats for mobile marketers. The first was put together by Chomp, 148apps.com, and Chillingo that commemorates Apple approval of 500 million apps for the App Store. It offers a walk down memory lane of Apple's highly successful App Store and key milestones, as well as great stats on the distribution on the types of apps, price of apps, most popular apps, etc. You can click on the image below for the full size of the super-long infographic. 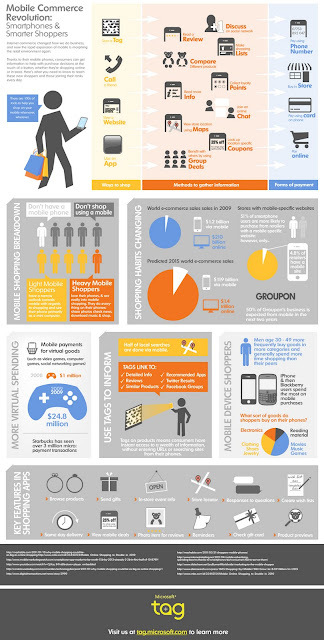 The second infographic is from our friends at Microsoft. The Tag team compiled stats on mobile commerce and offers some interesting insights on how mobile fits into the customer shopping journey.